Completely portable and streamlined machine Pilates. COR (center of the room) Pilates Wheel allows you to do hundreds of exercises and workouts anywhere you want. All the features of COR with an added anchor system. The anchor can be secured to any fixed or heavy object for real feel reformer. Allows you to make progressions from COR movements to more advanced anchor movements, increase repertoire, and gives you access to more instruction, including strength and cardio workouts. Our portable program lets you do pilates workouts in the comfort of your own home or with you on the road. Our extensive video library will serve as your very own personal trainer, so you can do the classes when it's most convenient for you. Plus, new LIVE instruction every week via Facebook Live! Watch as Founders Brian and Kristin explain exactly what you receive with the Pilates Wheel and how it will greatly benefit your life. The Pilates Wheel is a WHOLE BODY WORKOUT! Fun, Easy, Anywhere Fitness With Lasting Results! "The Pilates Wheel is the latest machine worth snagging. It only takes seconds to assemble and break down and allows you to perform hundreds of the same moves you’d do on an actual reformer. But instead of spending hundreds—if not thousands—of dollars on a full machine, these start at only $199 each." 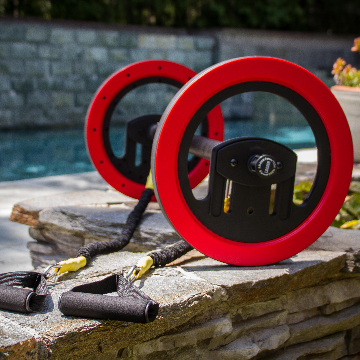 "Pilates Wheel takes the fundamentals of bulky and expensive Pilates equipment and distills them into a compact, at-home product." "Weight stations and reformers keep your body safe and a little bit guarded, but the Pilates Wheel allows you to work harder." "You'll be amazed by the transformation!" "What I love is that I'm so much more flexible then I've ever been, and I didn't expect that. I wanted to get stronger but what I didn't expect is that I would be so much more flexible. I feel taller and I can touch my toes. I've never been able to touch my toes in my entire life!" Our customers reveal how many inches and pounds they have lost using the Pilates Wheel in just 8 weeks. I'm not one to recommend much... but if you like pilates, (not the squats w/ weights that I did for two years and gained muscle weight), the stretch and tone every part of your body pilates. Without the $2500 reformer and/or the $50 per class - THIS IS IT. I've been doing it for a few weeks now, already see a difference in toning, flexibility, strength, and mentally I feel 100% better because every part of my body is worked in one hour. I bought the $199 version and it comes with workouts on DVD's but now I just go on their FB page and there are literally 100's of video classes I can do while it's playing on my desktop computer. All you need is a yoga mat. The gal Kristin is so easy to listen to (doesn't bug lol), give you all the reminders I always need like "shoulders down!" and I have to say it's even harder then the reformer because you need more balance - core strength - to keep the wheel steady. I'm still shocked every time I do something new that I did on the reformer and can now do with the wheel. It's crazy! AND it's portable! Just saying....one hell of an invention. — in Westlake Village, California. Got one last week and lovin' it! The pilates wheel coupled with your daily workouts has been a game changer for me! Thank you so much! Thanks!!! I love the live sessions! and the archived ones too! WOW!! Thank you so much!! I'm a winner anyway from having gotten the Pilates Wheel which is THE BEST fitness tool I've ever used - EVER!! I love it so much!! Happy New Year!! I wanted to take a moment and say THANK YOU for creating a great piece of equipment! I pride myself on introducing new and unique equipment to my clients which has made me stand out as an independent trainer. I could not wait to roll out (pun intended) the Wheel! It has received positive reviews in the short time I have had it. I am INCREDIBLY picky about the equipment I invest in. 1. It shows clients I take the time to research and put a lot of thought into the equipment I select, 2. It gives them the opportunity to learn about tools that are out there that they may not have had the opportunity to use or heard about. So thank you for allowing me to thrive as a creative trainer and wish you continued success and hope you create the next best thing! I couldn’t even sit cross-legged when I started working with the Pilates Wheel. I do one of the workouts —anchor is my favorite — every other day. I feel stronger, taller and can breath more deeply throughout the day. Part of my Wheel package was missing when it arrived and customer service worked with me to ship out immediately. I look forward to more workouts being posted! Just unpacked my wheel and did fundamentals... love it! This is my favorite piece of home exercise equipment! I love all of the different video classes. Great workouts in just 30 minutes. So impressed that you keep coming up with new workouts. Love to run across new moves, like the torso twist in this workout! My husband says that this was money well spent. I couldn’t agree more. I really like my Pilates wheel set up. I haven’t brought the wheel on travel yet, but plan on it at some point. I am enjoying all the live videos on FB. Good addition to the ones that come with the package. Although I have only actually been “live” once, I just do them at my convenience. Transform Your Body And Elevate Your Life. Shop With Us Today! No Questions Asked, 30 Day Money Back Guarantee. TRY THE PILATES WHEEL TODAY!